In 1952, Lt. Col. Frederick H. Scantling brought a detachment of two dozen Marines from Camp Pendleton, California, to the former U.S. Army glider base at Condor Field in Twentynine Palms to oversee the building of the new Marine Corps Training Center. A civilian construction firm built the new base, supervised by Naval Lt. Comdr. John P. Mapes. Today the 935-square-mile base is the Marine Air Ground Task Force Training Command, Marine Corps Air Ground Combat Center, and it is the premier live-fire, combined arms training facility in the world. Originally, the site was Condor Field (named after the birds, “best flying machines ever created.”)*. 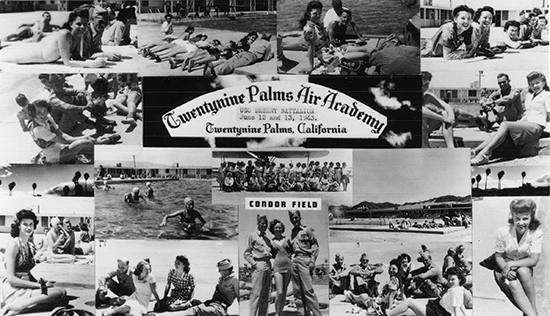 It was established in 1941-1942 as the Twentynine Palms Air Academy, a glider training facility for the Army Air Forces. The 17th Army Air Forces Flying Training Detachment began training in January 1942 in TG-1 and TG-2 gliders. In its first 15 months of operation, the air academy trained 1,600 glider pilots. 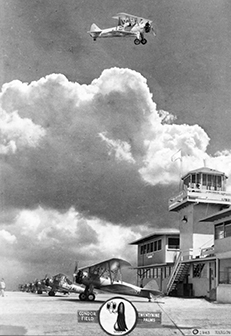 By early 1943, the glider training began to wind down, and Condor Field became an Army Air Corps flight training school, with “motor-powered planes.” The 17th Army Air Forces Flying Training Detachment continued for about a year with radial engine Stearman trainers. Then, in 1944, the Navy took over, adding the field to their gunnery and bombing ranges in the California/Arizona region, and operating the base as the Twentynine Palms Naval Auxiliary Air Station until summer 1945, when World War II ended. After that, Condor Field went into caretaker status, then was given over to San Bernardino County for several years. Following World War II, and a return of U.S. forces sent to South Korea in 1950 by President Truman, the Marines and reservists returning to the re-opened Camp Pendleton, California, soon found they were running out of room for training with artillery and rockets (later missiles). A search for better military training areas led the Marine Corps to “a weird hunk of desert where gliders once soared, and where Navy fliers later strafed and bombed.”* It was Twentynine Palms. 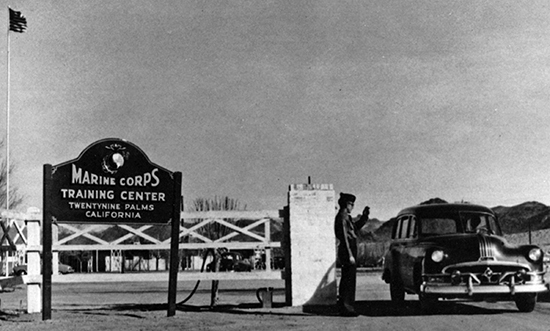 On August 20, 1952, Base Headquarters at Camp Pendleton issued Post Order 343, and some of the 930 square miles of desert north of Twentynine Palms, more than half a million acres, became a Marine Corps Training Center owned and operated by Camp Pendleton. 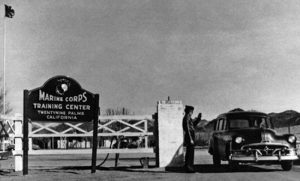 On December 15, 1952, Lt. Col. Scantling and his Camp Detachment arrived to oversee the civilian construction firm Twaits-Morrison-Knudsen-Macco as they began to build a new base for the Marines. Construction was under the watchful eye of Naval Resident-Officer-in-Charge-of-Construction (ROICC) Lt. Commander John P. Mapes. Both Scantling and Mapes moved their families to Twentynine Palms and became well known by locals in the community. The facility was activated on August 20, 1952, as Camp Detachment, Marine Corps Training Center, Twentynine Palms. In 1953, its Camp Detachment affiliation was dropped, and the base was redesignated as simply Marine Corps Training Center. Over the years, its name changed to Marine Corps Base (1957), then Marine Corps Air Ground Combat Training Center (1978), and it was redesignated on February 16, 1979, as the Marine Corps Air Ground Combat Center, Twentynine Palms. On October 1, 2000, it assumed the additional mission of Marine Air Ground Task Force Training Command. Today, the 935-square-mile base is the largest U.S. Marine Corps base and the premier live-fire, combined-arms training facility in the world. Approximately 20,000 active-duty Marines and sailors and their families are stationed at the Combat Center, and more than 50,000 active-duty and reserve Marines and sailors, as well as other U.S. and allied forces, train at the Combat Center 350 days each year. *Historical Sources include: U.S. Marines at Twentynine Palms, California, 1989, by the late Col. Verle E. Ludwig, USMC Retired.